The Placer County Transportation Planning Agency (PCTPA), in partnership with Caltrans, the South Placer Regional Transportation Authority, the Federal Highway Administration, Placer County, and the cities of Roseville, Rocklin, and Lincoln, will begin the first phase of improvements to the Interstate 80 / Highway 65 interchange. This first phase will provide a third lane on northbound Highway 65 from Interstate 80 to Pleasant Grove Boulevard and improvements to the Galleria Boulevard / Stanford Ranch Road interchange. The first phase will bring much needed relief to motorists who have been stuck in back-up on Interstate 80. 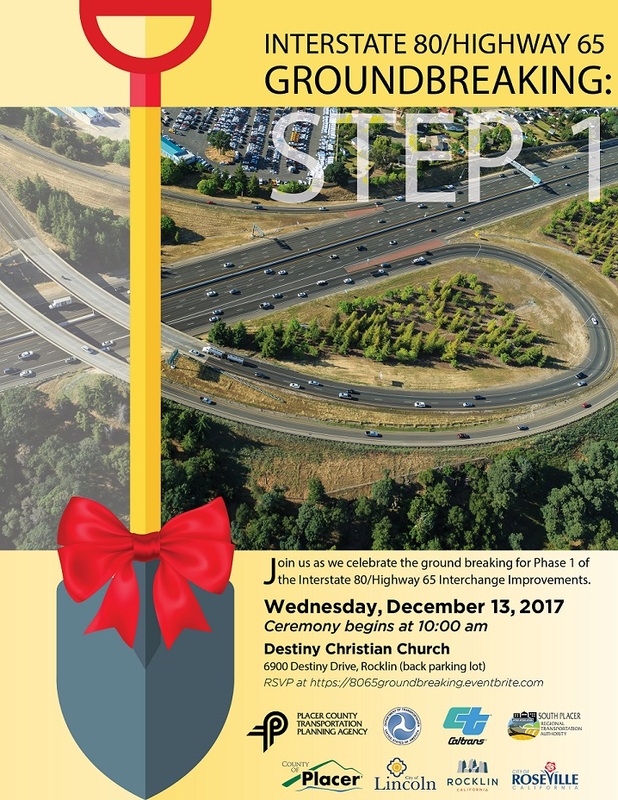 Community members are welcomed to join PCTPA for a groundbreaking ceremony on Wednesday, December 13 at 10:00 a.m. at Destiny Christian Church, located at 6900 Destiny Drive in Rocklin. Community members are also encouraged to visit the project website at www.8065interchange.org and RSVP for the groundbreaking online at www.8065groundbreaking.eventbrite.com. When: Wednesday, December 13, 2017 | 10:00 a.m.